Kenneth Woods writes that his first impulse for orchestrating the Brahms Second Piano Quartet came from coaching a chamber music course in the work and finding himself asking the players to imagine the opening as a quartet of hunting horns. His orchestral rendering makes a good case for this association, although most of the music that follows is more abstract. 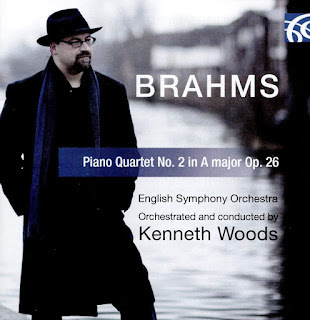 But Woods always keeps Brahms’s orchestra in mind, and the result is a version of the work that, with a few minor exceptions, could easily be mistaken for an arrangement by Brahms himself. Woods evidently has a keen understanding both of the quartet and of Brahms’s orchestral practice, but he also demonstrates an impressive discipline in keeping this large-scale music within the Classically proportioned orchestral framework that Brahms would have favored. The orchestra employed is that of the Brahms First and Third Symphonies, so there is no percussion beyond timpani and no tuba, but there is a discreetly employed contrabassoon, and the string section sounds large enough to afford the music symphonic scope. Woods makes particularly idiomatic use of the woodwinds and horns. String statements are often followed by woodwind refrains, where the combination of bassoon bass line and flute melody sounds particularly Brahmsian. So too does the interplay of solo horn and clarinet in the second movement. Listening for deviations from Brahms’s orchestral technique quickly seems futile, as it only brings up the smallest details: an occasional uniformity in the tutti textures and an anachronistic reliance on the lower end of the trombone tessitura. It is also tempting to speculate how Brahms might have adapted the movement endings for orchestral performance. Woods remains faithful to the brief codas of the outer movements, but Brahms himself would no doubt have expanded these into something more fitting to the scale. Comparisons with the Schoenberg orchestration of the First Quartet are inevitable, but they only serve to demonstrate the different artistic aims of the two arrangers. Where Schoenberg lays on thick orchestral textures, rich in doublings, Woods opts instead for transparent, clear textures, always sufficiently forceful, but never outside of the chamber-music spirit of the music itself. Another inevitable association is the idea that Woods is providing a new Brahms symphony for modern audiences—and we could argue that he has already done so with his revelatory recordings of the Hans Gál symphonies. But the Second Quartet is early Brahms, stylistically distinct from the symphonies proper. So we are not dealing with Brahms’s Fifth Symphony here so much as his Third Serenade. The performance, by the English Symphony Orchestra under Woods himself, is excellent. Woods writes that his first obstacle in making the arrangement was the high register required of the horns to play the work in A. The horn quartet is certainly stretched, but their ensemble and tone are rarely compromised. The string section also shows impressive discipline and stamina in the long melodic lines, and the balance and color within the woodwind section fully justifies Woods’s regular recourse to their solos and ensembles. Woods is as disciplined in his tempos as he is in his orchestration, maintaining brisk chamber music tempos in the outer movements, but affording some welcome breadth in the Adagio. The recording, made at Wyastone Concert Hall, is clear and bright. The back of the orchestra seems a little distant, although this has the surreptitious advantage of bringing a sense of distance and perspective to the evocative horn calls at the start. This review appears in Fanfare magazine issue 42:2.